Perhaps you have inherited Grandpa’s or Grandma’s wedding or engagement rings, old necklaces, or other jewelry. Maybe it’s your Mom or Dad’s ring that was passed down to you and you want to to use that very gold because in it is the energy of the marriage that lasted for decades. By wearing a new ring made form gold passed down, you connect to lineage, the ancestors, and carry that lineage forward. We can take that old wedding ring, or several rings, or even old gold jewelry and make new wedding and engagement rings. As custom jewelers and makers in a small Santa Fe studio, we have transformed numerous old wedding and engagement rings into new. Unlike the majority of jewelry these days, which is usually fabricated on CAD/CAM computer programs that generate images cut into waxes, we hand build most of our designs—from our Classic Comfort Fit wedding bands to our mixed-metal two-tone rings. 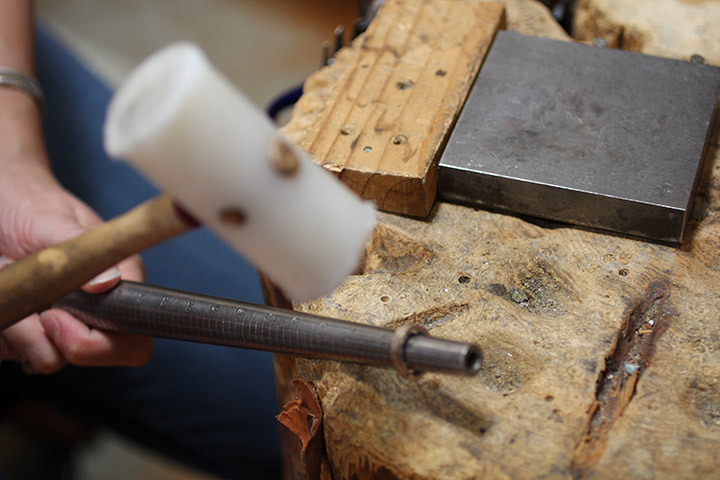 We are one of the few jewelers around who are actually artisan makers. That means that we can cut an old ring, flatten and mill it thin, and incorporate it into another band. We can also make new wedding rings from old wedding rings. As the only certified Fairtrade Gold jeweler in the USA, we pften make rings from scratch, totally in house. We form this metal into the right width and thickness of your wedding ring. 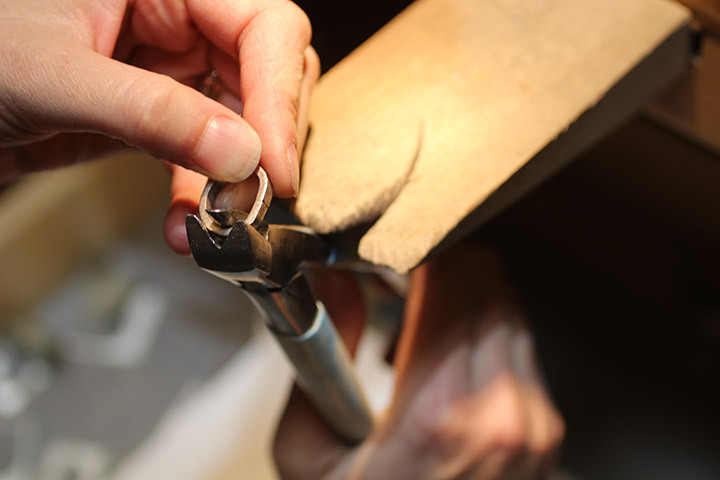 It takes a lot of skill, but between our three jewelers we have over seventy years of jeweler/maker experience! We work on old cottonwood stumps—a tradition for Southwestern jewelers that has been passed down for hundreds of years. Once this polished up, we have the ring shown! How Much Does This New Old Wedding Ring Cost? Typically, this process takes about 3 to 5 hours of work—depending on the complexity of the job. (White gold, for example, takes more time than yellow gold, due to the alloys involved.) Our shop time is $100 an hour—giving you a rough estimate of $400-$550. If what you want is a simple classic wedding band like your grandmother or grandfather wore, we can make it. Why Not Just Cast Using the Old Gold to Make New Rings? 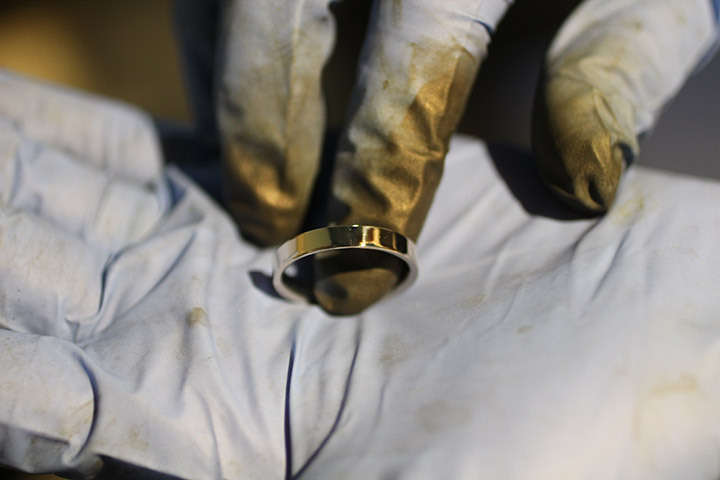 Recasting gold or platinum metal, or reusing any metal from an old ring poses difficult challenges due to the fickle and unpredictable nature of heat, precious metal, and unknown alloys in a hot flask. Mixing alloys makes it very difficult to get a clean cast because the alloys mixed with the metals have irregular properties. Therefore, it is always preferable to use pure metal with fresh alloy. But there’s an additional issue with reusing old rings to make new designs or custom jewelry. Suppose we melted down an old ring to use the gold to cast a new one. 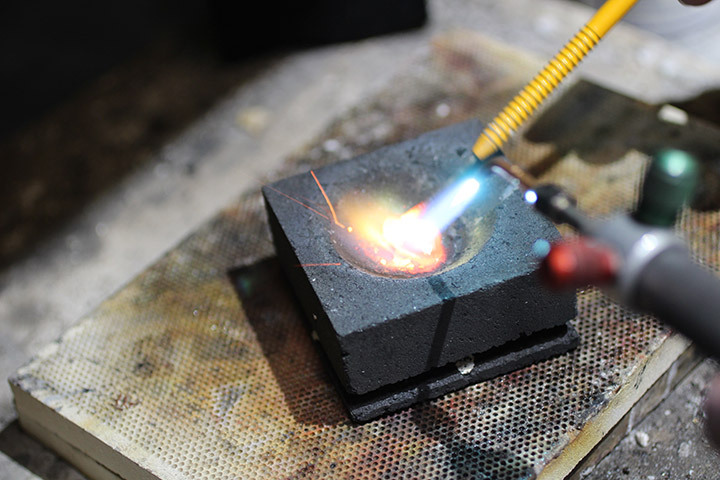 With casts, if a ring has a weight of 1/5th of a troy ounce (ozt), then it might require an additional 1.5 ozt to cast. 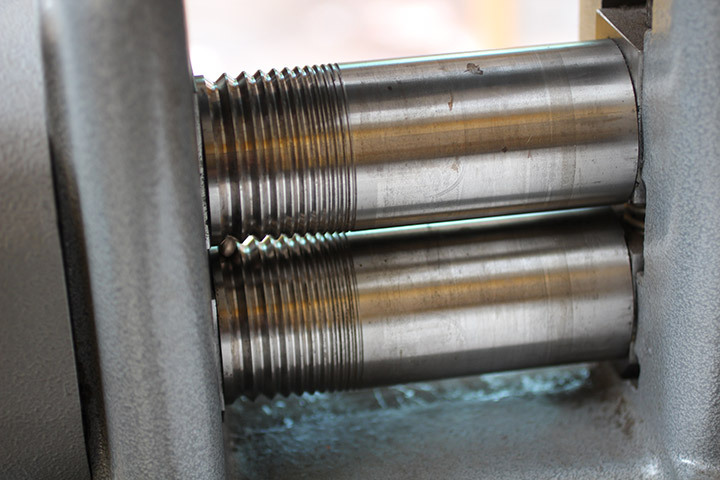 That's because there are elements created to hold the wax in place during the casting process, and other metal in addition to that is required to fill the mold and have the right amount of pressure. So the new ring, no matter what, would not have the same gold as the old ring. One final option that many of our customers take advantage of: we can purchase old metal and recycle it, offering 93% of the value of that metal toward the purchase of a new ring, based upon the spot price the day we receive the trade-in. 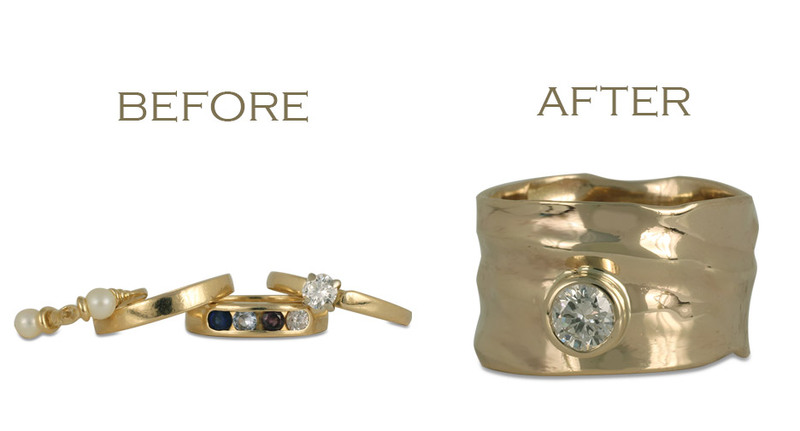 A customer wanted us to create something innovative with the gold from a wedding ring that had been her grandfather’s. She also had a bracelet with several diamonds on it that she wanted incorporated into the ring. 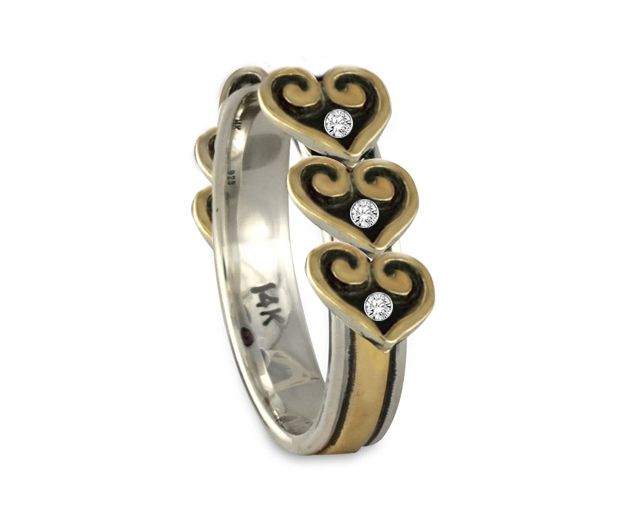 She wanted some kind of heart motif on the design, so I suggested a variation of our Corazon ring. Instead of having one center stone, we could use the heart motif around the ring and set her smaller diamonds in it. She wanted the piece to be two tone, gold and silver. So, we used her gold to make the center of the ring and soldered on silver boarders. Then we set the diamonds. Here's a question I received in my email in Oct. 2018. I've got an 18K gold ring and a 14k gold rings and I want to create one ring. I also have two small diamonds and I'd like to add an emerald as well into the design. Can you give me an estimate? Thank you! Let's say that, with the two small rings, melted into one, you want a basic ring such as this classic wedding ring style. Our shop time to make this ring is 4 to 5 hours so the cost would be $400 to $500 for labor. Here's another factor: sometimes in mixing old gold, particularly white gold. With the finish product, we end up with pits. The impurities in the alloys can make it difficult to have a really high polish finish without those pits in the metal. 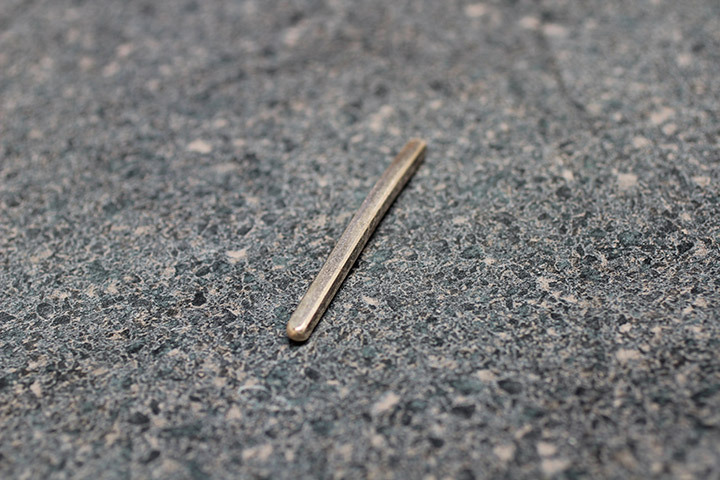 Sometimes we recommend a textured finish—such as our Playa style, which we can make in any width. We could also do a hammered finish, as shown with our River ring design. Another option would be for us to overlay one of our designs on top. For example, our Flores motif here, shown on top of a gold base, can be applied on top of a ring made with your gold. We have numerous designs to choose from. Setting the diamonds is $39 each. This is assuming that they are small diamonds, under 3mm. If they are larger then the price would be different, depending upon the size. As for the emerald: again, that depends on the size. But a 5mm round emerald set in gold would cost about $150 to set. We have some great emeralds in house if you are interested. Here's info about our emerald sourcing. This example is not exactly making a ring from a ring, but it might help you imagine what’s possible. A woman who sadly lost her husband after many decades of marriage wanted us to make something out of his wedding ring. We were able to cut the ring and stretch the gold into wire, from which we made this heart pendant. This project was a bit more challenging, but again it gives you a sense of what we can do as custom jewelers who make pieces by hand. Our client asked for a free-flowing wide ring that used her existing diamond. We worked with her back and forth over what that image should look like and we came up with this design. It required a lot of finessing from our jeweler, Michelle, who is more accustomed to making less organic looking designs. In the end, our client wrote, "I received the ring and I love it. It fits perfectly too!" Hope this provides at least a starting point! If you have any more questions, let me know. Email us at info(AT)reflectivejewelry.com. Or you can call us at 888-733-5238, You can also leave your question a comment and we'll get back to you on this page as soon as we can. One more thing: if you want to know what people think about working with our company, check out our Google reviews. I already have had some of my dad's yellow gold rings looked at and they are able to be melted down and made into a 6mm band with an edging. Im looking at other estimates? Hello Mr. Smith, yes we do this sort of thing all the time. Are you local to Santa Fe? Or are you out of town? Hi Gloria, In some cases, yes, we can do that. Please contact us at 888-733-5238 to discuss possibilities. Thanks! I have ~20gm of old gold rings (~6rings ) from family and previous marriages that I was hoping might be used to make two plain wedding rings (1x 2-3mm and 1x 3-4mm) that could be inset with an emerald and two diamonds reflecting the emerald and diamond engagement ring I gave my fiancé last year. I have two emerald and diamond rings (1x eternity ring and 1x engagement ring) that were my mothers that could provide the gemstones. What are the prospects of my realising my dreams ????? Hi Barry, We can do this. Give us a call at 888-733-5238. We'll also give you 93% of the spot value for the gold that we don't use, which can go toward the cost of producing a ring. Hello, My fiance and I were wanting him to use an family heirloom ring (18k simple band 3 or 3.5 mm) that happens to be a number of sizes too small. It's 8.5 or so and he needs 12. We are located in Indiana. Are you able to take long-distance requests? If so, what might that run? We'd be interested in it being flattened a touch too as opposed to rounder in shape. We definitely work long distance customers all the time. 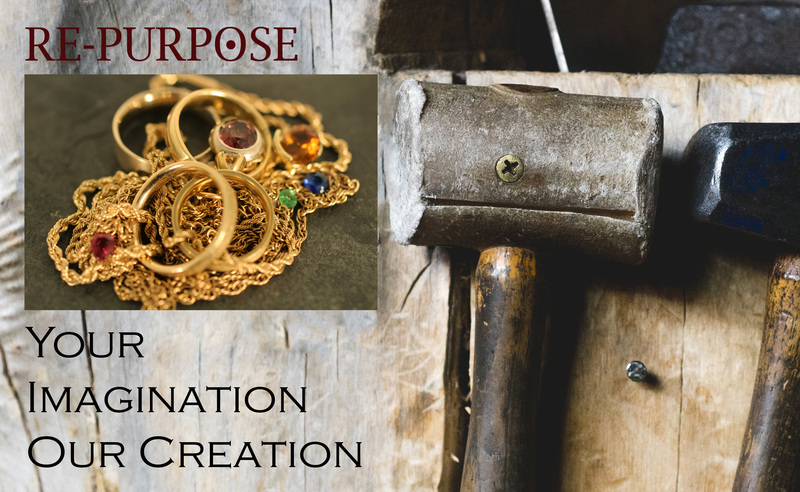 We can help you reshape and remake your ring. Give us a call at 888-733-5238 or email me: Marc(AT)reflectivejewelry.com and we'll figure out the next step. I have a wide gold wedding band that I want to reshape into a square ring with my initial on it. Is that possible. Yes, I think that your request is possible. Feel free to contact us with your idea. I would like a rough estimate on making a new wedding band for my husband out of my old wedding band? Sorry for my slow reply. Generally, it depends upon the time it takes, but a range might be between $300 and $500,. I have two substantial wedding bands of mine and my deceased husband. They are yellow gold with a flowers engraved around (I, of course, can send you pictures). I would like to have a small (I have small wrist) simple bracelet made out of them and retain at least one of the flowers in the design. I realize that more gold may be required - and wouldn't mind a mix of white and yellow. Is this something you could help with - or do you have any other ideas for repurposing such sentimental jewelry? Thanks in advance! I'm confused. This article essentially says you can't make a simple gold band using other gold bands (new gold band made from Granny's old bands). But in the comments attached to the article, you say, test, we do it all the time. I have 3 inherited gold bands, I'd like made into one gold band. Is that possible? Thanks for pointing out the inconsistency. Our processes have evolved over the two years since the article was first posted. I just modified the article to eliminate the inconsistency that you pointed out. So, in fact, we can make bands from Granny's old wedding ring. Can a gold band with 8 small diamond chips and a small garnet be made into a white gold or platinum band with or without the jewels? We're located in Santa Fe, NM. But you can always send us what you have. We work a lot over the phone with people and have for over 20 years. Hi Annette, It your mama's ring is indeed 24K gold, then it would be quite unique. I've never had 24K gold rings come into my shop. More than likely, it is 18K or 14K gold. That being the case, we could certainly make two rings out of it, provided that there is enough gold for us to do so. Ultimately it would depend upon how wide your mama's ring is and how wide you want your rings. But assuming all this worked out, I think that for us to make two new rings out of that one old one would run about $800. Hello, I am interested in repurposing a ring. Please call me at 5408728144 or email. Thank you! Sure, Jessie-- I'll call you later today. Hello, I'm interested in remaking my wedding ring and band into one single ring. I'd like something simple with the diamond imbedded. It's a small diamond, so I'm thinking that would help to imbed it. I have no idea if this is possible. I'm wondering where you are located, and what the process is? Thank you for your response. We can definitely do what you'd like. In terms of process, the best thing is that you email me : Marc(AT)reflectivejewelry.com or just give us a call at 888-733-5238 so that I can answer your specific questions. In most cases I can give you a pretty good price estimate. If you decide to move forward, you just send us the rings and once we agree upon everything I take a 50% deposit, and the balance once the job is done. Just an amazing service your jewelry-shop provides here. You are among the most competent jewlerers I have ever known. Congratulations. Thanks for your very kind words about our shop. Most jewelry today is designed on a computer, printed out on a 3 D scanner, and sent to casting. Very little handwork, except setting stones. We are really old style jewelers, working by hand. Using anvils and hammers. We have over 80 years of bench experience among our jewelers. The love of craft and tradition is infused in the piece itself. I have an old sapphire ring that I would like to make an engagement ring out of and a wedding ring and if possible use 1-2 of the stones to put into a male wedding band? Let me know how you want me to send you the photos of the ring. Hi Cher, If it is white gold, we can work with it. If it is platinum, we can take the metal and recycle it and give you 93% of its market value. Give me a call at our shop: 505-988-7393 and we can discuss futher. Good morning! I want to repurpose a family engagement ring, as my wedding band. The ring looks to be white gold or platinum, I'm not sure. The ring has a small diamond that I'd like to keep, maybe in a bezel setting. I would also like to purchase smaller diamonds to set around it in a channel or pave type setting. Lastly, I would love to engrave two dates inside the ring. Is this possible? I would love any of your suggestions/creativity! I have a very new ring that I’d like changed. I proposed to my now fiancé a little over one year ago (wedding scheduled for October of this year), with this ring. We have since bought a newer ring of the exact same style, but fit better so I have the original ring (minus the center diamond which is in the new ring) that I’d like to have turned into the wedding band. Is that possible? It is 18k white gold.